We understand the growing needs for companies to streamline, become more efficient, improve overall quality, monitoring cost while remaining competitive. Our team of experts is here to assist you meet these objectives... Implementing innovative and creative approaches and solutions; based on the ever-evolving global community. Our IT / Telecommunication Division represents 18+ years of professional experience. An example of ongoing evolution related to telecommunication solutions is, i.e. Smart PRI Trucking & Internet Solutions. To find out more feel free to contact us. Entrepreneurial Café’ & Entrepreneur Services, advertise with us, voice over, promo / commercial copywriting, become a sponsor with our station and/or show, Solar & Wind Energy, and more. 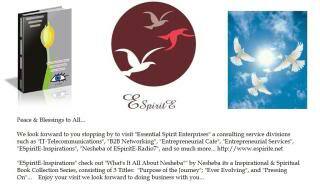 We appreciate your business, and advertising with “ESpiritE-Radio7” with host ‘Nesheba. Our company represents over 18+ years of professional experience working with Fortune 500 companies. We have worked on a variety of enterprise projects and migrations. We look forward to doing business with you & your company.